For me, reading about what this particular set of readers saw in the trilogy made my experience of the books significantly richer. It made me a little more aware of what the Divergent trilogy had to offer, and led me to engage both with the story and my own world in new ways. If there’s one lesson we can take from the Divergent trilogy, right from the very first book, it’s the value of, well, “divergence”—of the differences between individuals, of our own capacity for seeing a situation in different ways. Which is why an anthology like Divergent Thinking: YA Authors on Veronica Roth’s Divergent Trilogy seemed like exactly the right way to talk about the Divergent trilogy: get a dozen writers together and ask them each to write about what in the story resonated with them. 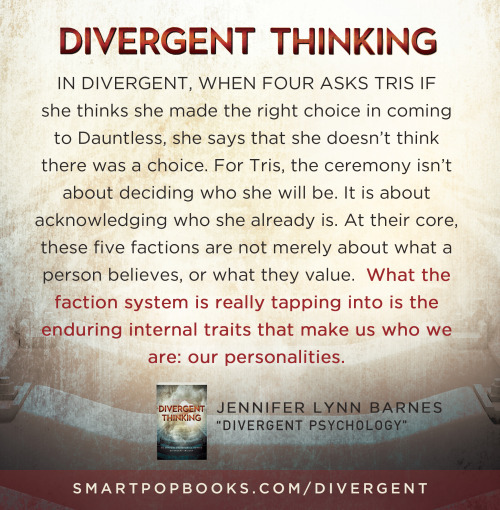 Because yes, Divergent Thinking talks about the whole trilogy. Which was a huge undertaking, actually—Allegiant came out on October 22; two months later we had more than 60,000 words not just written, but edited, typeset, proofed, and sent off to the printer. We did one other thing with that time, actually—and that was commission some original art from Risa Rodil. One of our essays is from V. Arrow, who you may remember from her map of Panem that made the social media rounds around the time of the first film . . . or her book The Panem Companion, which grew in part out of that map. For our anthology, she applied a similar approach to the Divergent trilogy that she did to the Hunger Games, looking at Divergent’s text for clues to where the locations in the series mapped on to today’s Chicago. But that meant we needed a visual way of showing those locations. V. introduced us to Risa’s terrific Divergent fan art, and we commissioned Risa to adapt her faction symbols for our use, plus design a few more. We liked them so much we did more than just use them on V’s maps; you’ll see the symbol of each author’s chosen faction accompanying their bio, and we made a set of faction pins that we’ll be giving away during next week’s multi-site book launch event (and at San Diego Comic-Con and a few other events later this year). If you aren’t following us on Facebook, Twitter, Pinterest, or Tumblr, you may not know we’ve been releasing a graphic quote from a new essay each week. So if you’re looking to get even more of a taste of the book, you can check those out (and, of course, share them, too!). For any educators reading this, we’ve put together a Common Core lesson plan pamphlet that goes with Divergent Thinking, which you can find over on the book’s educator site page. We like to think of it is as our contribution to making English class a little bit more fun. We hope we’ll see all of you back here for the launch event next week (more details coming on Friday! ), and that if you pick up a copy of Divergent Thinking, print or e-book, you’re enjoy reading it as much as we enjoyed putting it together!